Sadly, the paradox of lazy days is that they end up stressing me out because of the things I’m not doing. I have to remind myself that yeah, I could be writing a post or running 10k, but the post will be horribly written (with like a million typos) and the run would probably end up being a lazy 5k. I tend to associate these lazy days with being a slacker, but I really think it's quite the opposite. As long as you don't spend every day lying around in bed then you're not really slacking off. Taking a day (maybe even two) to relax is good for you and is definitely not the end of the world. Lazy days are good for you. There! And on lazy days, a simple and quick recipe such as these Greek-Style Turkey Burgers is just perfect. I know I said this already but I’m gonna say it again, simple food can be delicious. Keep it simple and that’s all you really need to make a good thing work. Pretty basic ingredients in this turkey mix: ground turkey, crumbled feta, milk, mint, parsley, and seasoning. If you are ready to have your mind blown by a simple (yet crazy delicious) turkey burger, then this one’s for you! 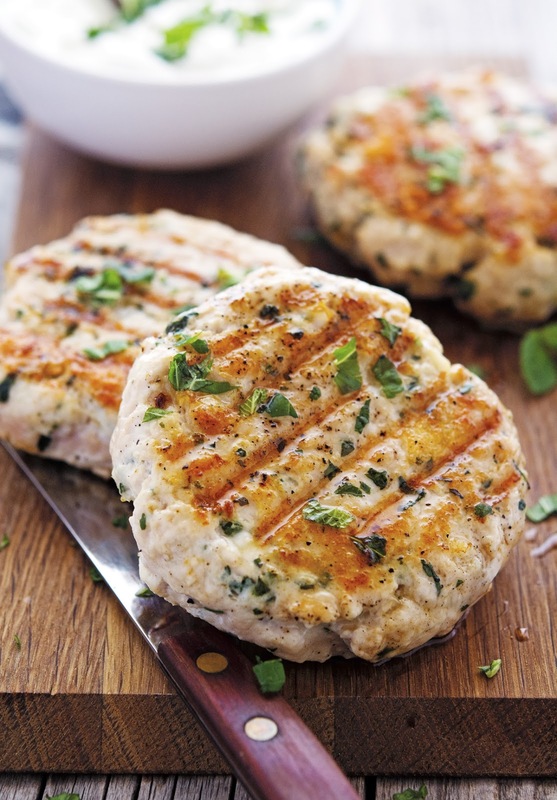 Greek-Style Turkey Burgers with Yogurt Sauce Print this recipe! 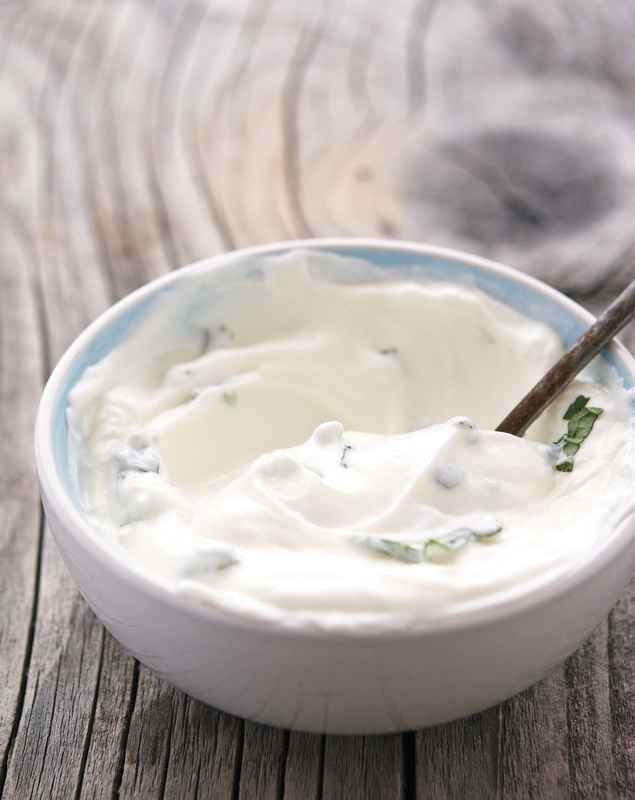 In a large bowl combine turkey, feta cheese, mint, milk, parsley, salt, and pepper. Using your hands mix until thoroughly combined. Divide meat mixture into 4 parts and shape into patties. Heat a grill or a grill pan over medium-high heat. Grill the burgers until cooked through and the inside of the burger is no longer pink. To make the yogurt sauce combine all ingredients in a small bowl. Take a taste and adjust seasoning if needed. Serve burgers with a dollop of sauce on the side. One burger yields 204 calories, 12 grams of fat, 0 grams of carbs, and 12 grams of protein. Haha winter is getting all up in my mind too. Cave desires rule my eyes and I just love the idea of honey and fires and cocomilk lattes swirled with cinnamon. Honestly I think our brain is signaling to hibernate and yet we still live in this modern world. To the cave with turkey burgers and cocomilk chair lattes! Clients ask me what I do on the weekends during my free time, and I used to feel guilty for saying "sometimes, absolutely nothing but maybe/probably binge watch a show on Netflix". I felt like I had to say I went hiking or camping or ran races! I agree with you, though. As long as they're not constant, lazy days are GOOD FOR THE BODY. Also, this recipe looks so delish. I love yogurt sauce! 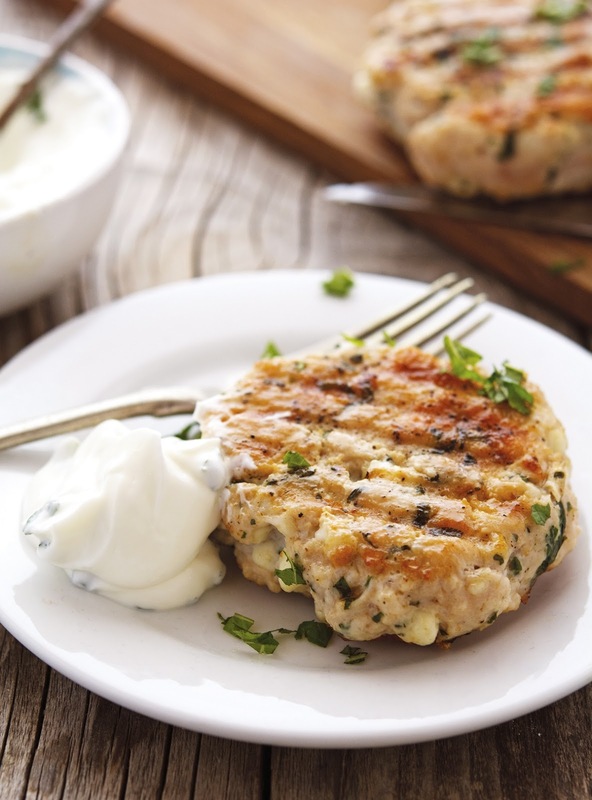 Love turkey burgers, and your yogurt sauce is a perfect way to enjoy it! Hi Mike, time off is good for the soul, everything about you screams doer not slacker!!! Heck yeah to Lazy days! I am a huge proponent of the fact that they are good for my soul! But, my plate is almost always full - that's why I am hoping we have a couple of snow days here in Atlanta as even an inch of snow means we shut down - and if I cannot find my driveway well - am staying home and making these! Love the feta in them! I so agree with you on Lazy days. I could not have put it into better words. I love being active, being productive but a few hours here and there, so good. It makes me relax, quite time even if I'm watching TV is something I crave once in a while. Love these burgers Mike, you always create some of the healthiest and good looking meals. These look outstanding, love the caramelization and grill marks on these. Simplistic and flavorful. Perfecto! And sometimes being lazy is just fine… I spent 6 entire days not touching my blog, chilling and taking hikes up here in Portland out in Beavercreek. Highly recommend it, but now it’s time to hit the airport, get home and see my dogs! I'm terrible at taking time off, I always revert back to work or chores but that's something I want to work on because whenever I do relax it's so awesome I can hardly bring myself to get back in the game! Good thing for me that cooking is like relaxing, and the simpler the recipe the better. I can't wait to try these out! Hi! I love your recipes — just had the Kung Pao chicken on Friday! I was wondering if your calorie count for the burger includes the yogurt. If not, do you have the additional calories for the yogurt? I was inspired by your recipe to prepare some chicken burgers ... and frankly delicious! again thank you for sharing such delights! I just tried your recipe. Thumbs up! Happy Friday! Just letting you know I featured this recipe in my Low-Carb Recipe Love on Fridays post today. I hope a lot of my readers will click over to get the recipe and try it! I just made this last night and they were sooo yummy! Made this last night: phenomenal. Best turkey burgers ever. Thank you so much for this amazing recipe! I'm out of milk. Do you think I could substitute a bit of the yogurt instead?? ?